Trigger and Content Warning: Colonial Violence, Racism, Anti-Blackness, Anti-Indigeneity, Gender-based Violence, Militarized Violence, Islamophobia, anti-Refugee Rhetoric. In the past year Rohingya Muslims have been constantly featured by Western media outlets, particularly as their persecution in Burma/Myanmar has been deemed to be “ethnic cleansing” by the United Nations. The Rohingya community, which is primarily Muslim but also includes a Hindu minority, considers itself to be Indigenous to what is now Burma/Myanmar; Rohingya also currently reside in India, Bangladesh and Saudi Arabia. Burma/Myanmar does not recognize their claim to indigeneity, despite adopting the UN Declaration on the Rights of Indigenous Peoples, and does not recognize them as citizens. The history of violence against the Rohingya has colonial origins that includes colonization by the British in the 19th century, persecution by the Japanese during WWII, and different military governments since independence in 1948. The nation-building process after independence further entailed racial discrimination against the Rohingya based on anti-Blackness and Islamophobia, even when not all Rohingya are Muslim and not all Muslims in the area are part of the Rohingya community. By the 1970s the constitution of Burma/Myanmar did not recognize the Rohingya, which has prevented them from being recognized as citizens. Hence, for decades, the Rohingya (among other groups, including other Muslims) have been stateless. Since 2015 militarized violence against Rohingya people has increased. The violence is largely attributed to the head of state, Aung Sun Suu Kyi, a recipient of the Nobel Peace Prize (1991) for her activism against Burma/Myanmar’s military regime and her efforts for the country to become democratic. She has also been presented with other human rights-related honours and holds honorary Canadian citizenship, which some Canadians believe should be revoked by the Canadian government due to her involvement in the Rohingya genocide. To date Burma/Myanmar faces few sanctions for its human rights abuses and still receives armament from Israel, among others. On September 2017, Burma/Myanmar also blocked UN aid to the Rohingya community. One thing to note is that the ongoing discrimination and violence against the Rohingya community did not become a largely publicized media issue until fairly recently, despite the fact that documentation of Rohingya persecution and human rights violations against the community date back to the early 20th century. Similarly, the issue was largely ignored and downplayed by governments and organizations who are said to be committed to human rights, until fairly recently. Countries with large Muslim populations have also made only symbolic pledges of solidarity, including Saudi Arabia. Since 2012 almost half a million Rohingya have been displaced and many more have been murdered. Shireen, Eren, Sobia, Fatin and Shereen share their conversation in this post. Displaced Rohingya refugees from Rakhine state in Myanmar- via Al Arabiya. Shireen: I can’t even get started on the (formerly) lauded Aung San Suu Kyi who has been ridiculously silent on this issue, to the point where her friend and ally Bishop Desmond Tutu publicly spoke about her toxic silence, by saying “If the political price of your ascension to the highest office in Myanmar is your silence, the price is surely too steep.” Her treatment of this situation (vacuous comments or stone silence) is deplorable. Last March, Suu Kyi was interviewed by Mishal Husain and she was particularly nasty during the interview. After being challenged by the award-winning presenter, the flustered leader made a bigoted comment “No one told me I was going to be interviewed by a Muslim.” This further shows that her regard for Muslims, in general, is non-existent. She also has a history of ignoring calls from the United Nations in regards to the violence (although she would not be the first head of state to do so). Eren: First of all I would say that my prayers and my solidarity are with the Rohingya Muslim community, the colonized, the displaced, the stateless, the persecuted, the murdered, the survivors… But picking up on Shireen’s comment, what is happening to the Rohingya community, unfortunately is all very common to Indigenous communities across the globe. And as angry and outraged as I can be with Burma/Myanmar’s government and its de facto leader, Suu Kyi, I am the most angry at the international community, at human rights institutions, at every Western country that claims caring about human rights, because the reality of things is that no government and no institution has ever cared enough about Indigenous communities. The UN Human Rights Chief just called the genocide of Rohingya Muslims “textbook example of ethnic cleansing.” Hmmm… okay cool… so what? What are we going to do about it? Shireen: Well, now that aid organizations and the UN are getting involved, the government is further ignoring Medecins Sans Frontieres and Human Rights Watch‘s calls to stop the violence and has gone as far as blocking UN aid! The ways in which Rohingya Muslims are being affected by the violence is staggering- more than 400, 000 have been reported to have left Burma/Myanmar by any means possible. These innocent people are being massacred, bodies being pulled from rivers on the border of Bangladesh. They are being rejected and brutalized from their own land. Bangladesh, the country where many Rohingya Muslims live as refugees, is trying to cope with the fact that the violence has intensified and that little aid is making it across borders. In 2012, Bangladesh had refused to admit Rohingya Muslims for asylum. 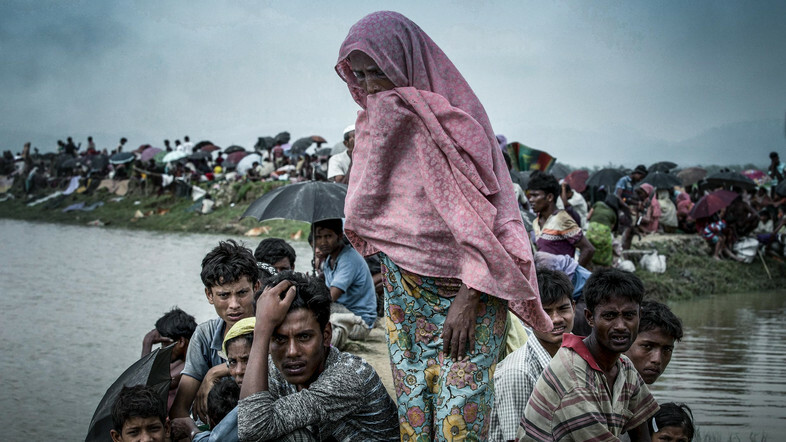 The government argued that they had no legal, moral or ethical responsibility to do so; but in the past few weeks the Bangladeshi government offered land for a refugee camp.Yet, them coming around to accepting refugees is still problematic in that Bangladesh’s refusal to help makes it complicit in a case of genocide. Forget the helping of fellow Muslims and giving them respite and support, forget even the horrible violent crimes and violations committed against women and young girls; but can we imagine advocating for protecting man-made and colonial borders while people are being burned alive for fun? Eren: The thing is that it is not only Bangladesh that is complicit. No other country has stepped in, other than symbolic gestures of concern and solidarity. This situation has been going on for decades! Unfortunately we live in a world where Indigenous peoples aren’t privy to genocide… we call it “cultural genocide;” we call it a byproduct of colonialism; we call it “development,” etc. Not to mention that the burden of “proving” genocide lays with Indigenous communities around the world, particularly women. It is women who have to look for their missing family members; who have to bury their children; who are raped and violated over and over again by militias, army, Blue Helmets and even aid workers! Wanna know why this has been going on for so freaking long and no one cares? Because like in Guatemala and the Maya people and Darfur with the Fur, Masalit and Zaghawa, it isn’t genocide until you, as an Indigenous community, can show that “enough people” have been killed; that it is “racially or religiously motivated;” that there is a paper trail showing intent; and that the perpetrators are really responsible… until then, it is just an unfortunate security matter, maybe even human rights violations, but nothing else. Sobia: Part of the problem, is how ignorant we are about the issue. The other day I read, in a Canadian newspaper, a brief history of the persecution of the Rohingya in Myanmar during and post colonization. That piece was the first piece of writing I had read on this particular history, and it was laid it out so well. This was also the time I learned, for the first time, that the Rohingya have been facing persecution for over a century now. We’re talking since the late 1800s/early 1900s. Yet, as Muslims we NEVER talk about this. I have grown up hearing so much about the Palestinian cause (as we should); yet, even though my family is from the same region as Myanmar (Pakistan), and even though there are Rohingya refugees in Pakistan (who don’t have equal rights), I never heard a word about this persecution. In various khutbahs I’ve heard prayers for the Palestinians, and sometimes Chechens, Kashmiris, Bosnians as well, but never the Rohingyas. It had me thinking about who we, in our Muslim communities, prioritize for empathy and who we relegate to the bottom of the list, if they’re on the list at all. What is it about who we, within our communities, care for and whose existence we never acknowledge? What does this sudden attention to the suffering of the Rohingya, despite their century of suffering, tell us about not just the international community at large, but our Muslim communities, as well? Fatin: Yes, in fact, before discussing doing a roundtable for MMW I didn’t really know much about the situation in Burma/Myanmar. However when I saw this tweet by Nikki Haley, US Ambassador to the UN, on September 13th , I felt it was pertinent to the conversation. Just as Eren said, it’s all about proof. “IF reports..are true.” She literally posted this with a photo of a woman and child crying in anguish and is calling that pain into question. As ambassador, Nikki Haley should have information available to her that makes this tweet both callous and egregious. Her following tweets call an end to the violence and thank Bangladesh for hosting refugees fleeing Burma. Interesting, since the United States has taken such a violent stance on refugees. So now what? More discussions by UN panels? What gets done to actually protect the Rohingya population? Eren: See… all these tweets that UN personnel are now releasing and the ways in which mainstream media covers the issue, make me want to smash my computer… This is what I was telling Shireen, governments and multilateral organizations, like the UN, are now playing the “let’s prise Bangladesh (after their refusal three years ago) and pretend that we are doing everything by the book and hope no one notices that the we let this slide for decades” game… mmmm, what? Fatin: Social media is always a blessing and a curse in situations like these. It’s valuable for spreading the word and raising awareness. But at the same time, a flooding of images can have people scrolling right past them. I have been guilty of this myself. Between wars and natural disasters, desensitization to these crises sets in. Not to mention feelings of helplessness as conflicts continue for decades. On the other hand, it’s heartening to see to see protests around the world and some Muslim majority countries denouncing the violence. But is that enough? Shereen: I also was not sure how to participate in a conversation about what is happening to the Rohingya Muslims, but I could not remain silent because I feel like there must be something we can do to help. I think it is time we start to rethink how we view refugees, and as Eren mentioned, how we conceive Indigenous peoples within our own communities. With the world’s current refugee crisis we are, ‘witnessing the highest levels of displacement on record.’ This affects primarily Indigenous and Black communities in developing countries. The use of fear tactics in USA and the world’s governments using refugees as scapegoats for the world’s problems has left me feeling angry and disappointed. For example, an article by The Economist discussed the refugee crisis as a ‘potential solution’ for the much needed younger workers in an ageing European workforce. This is unacceptable. We need to put pressure on our leaders to devise positive integration methods that don’t play on an imagined fear to win votes but instead gives us practical solutions to a humanitarian problem that is impacting all of us. The current stance of deploying fear tactics and an oversimplified deduction that the problems stem from refugees or ethnic minorities has happened repeatedly throughout history following economic recessions and has only led to devastating consequences for everyone. We cannot allow that to happen again. Shereen: I believe in humanity, and I believe it is our duty to help those being persecuted in whichever way we can. We all have individual talents, be it writing, art, social media platforms, fundraising, donating or even physically volunteering. So instead of thinking that we can’t do something, or that our contribution will be too small, I ask that we do whatever we can so these communities know they are not alone. Post on your social media, protest, set up a fundraiser or volunteer. Every little thing helps. Thoughts? Don’t forget to comment below.